Last week I took a trip to Orange County, California. The endless blue of the sky and ocean is curiously exhilarating and calming at the same time. I felt raring to go outside yet very peaceful inside. Hat and sunglasses required as the sun is relentlessly brilliant and hot, at least while I was there. Basically a follower, my first experience was to wait for my companion at a coffee shop. Like Seattle, building projects proliferate in the OC. 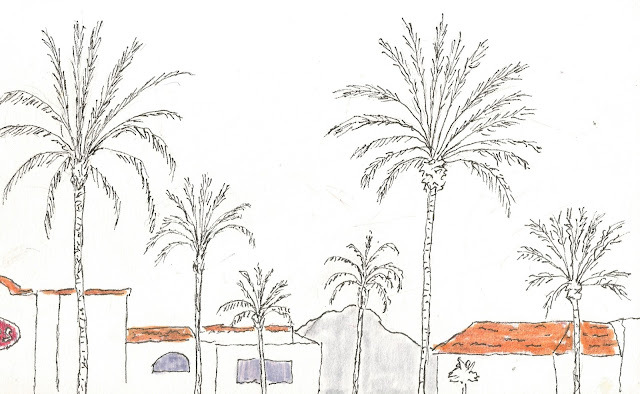 Hacienda style is mandatory with red tile roofs, white stucco walls and palm trees or succulents as landscape accent. 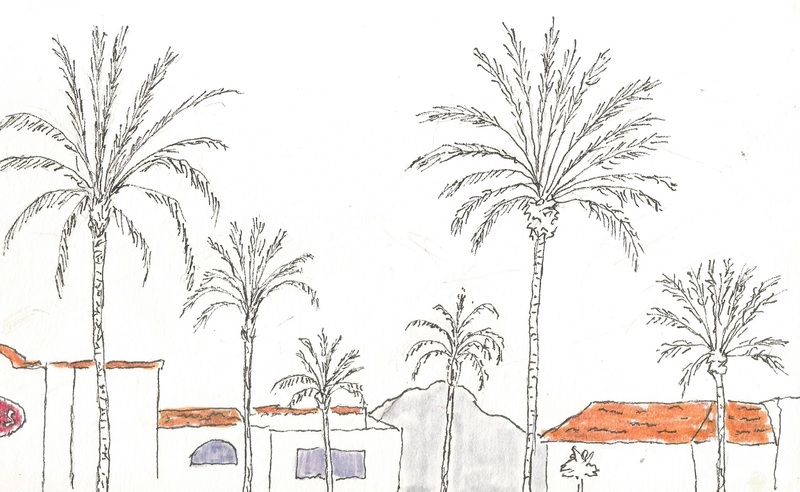 As I sketched from an outdoor seat in the shopping center, palm trees fanned out in orderly fashion creating a regal look for a not-so-humble parking lot. 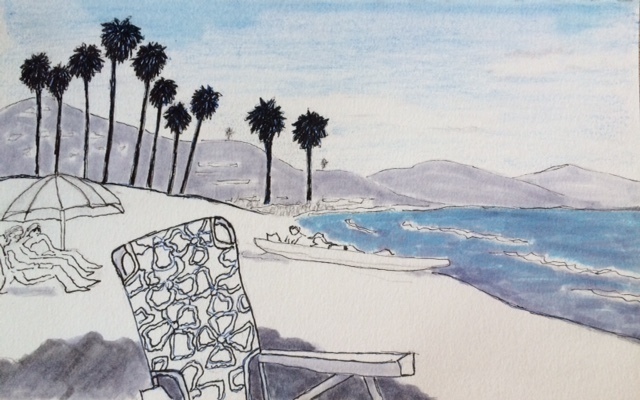 Taken to the beach as promised, I sketched under the shade of an umbrella at Doheny State Beach until we noticed a crowd gathering at the cove to watch the 2016 Pacific Paddle Games. Paddle boarders from around the world, places like Tahiti, Australia and Brazil, joined enthusiasts from the area for the games. Women and men competed in separate events paddling out through the surf, around an obstacle course, and back again 3 times. If a paddle boarder surges ahead going out, the same paddle boarder falls behind if a competitor catches a wave coming back. The strength and athleticism of the contestants braving the powerful elements of the Pacific amazed me. Cameras and drones surrounded the beach. Loudspeakers boomed with play-by-play action reports adding to the excitement of the event. During the Tacoma West Coast Sketch Crawl I met many sketchers from the San Diego group. After hearing of my plans to visit Dana Point, one of the sketchers recommended I read Two Years Before the Mast by Richard Henry Dana, Jr. to learn about the early marine trading days along the California coast. Following her advice, I procured the book and became completely immersed in the story of a mariner’s journey aboard the tall ship Pilgrim. Dropped off at Dana Point Harbor to sketch, I discovered a replica of the Pilgrim docked in the harbor. The Pilgrim replica is a living history classroom for the Ocean Institute located at the harbor. 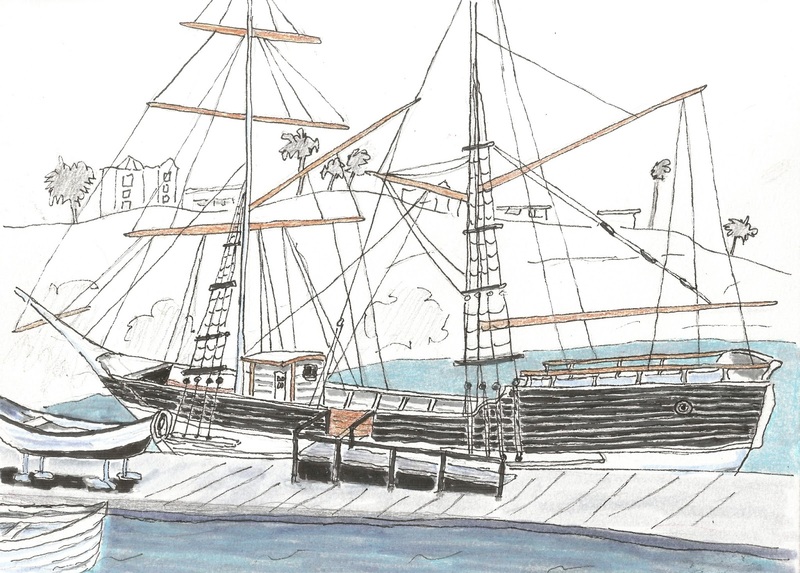 The original Pilgrim docked at San Juan Bay (Dana Point) several times. Hundreds of school children marched past my sketching perch on their way to the institute. At 90 ft., the Pilgrim seemed very small for the amount of action on board as it traded up and down the coast. It’s hard to imagine working aboard this ship in 1835 with 9 other sailors for one or two years at a time. The descriptions in the book about the sails and masts during storms at high sea resonated as I tried to draw the dangling ropes. Now that I know a replica exists, I hope to go to a re-enactment some day. Good sketches. I like that area of Orange County! Ugh... I hated "Two Years before the Mast" when it was required reading in school. I doubt I could stomach it now as an adult. Thanks! I recalled it was required reading but I can't recall reading the book when it was required. The vivid descriptions of life aboard the Pilgrim and explorations of the California coast kept me engaged this time around.